Anonymous, Have You Not Hard of Floryda? One of the earliest poetic references to Florida appears in an anonymous and undated ballad, entitled “the preme Rose in the grene forest.” Other stanzas, probably written in the sixteenth century, make no reference to the Americas, and in this short section, the balladeer clearly alludes as much to Renaissance conceits of the Golden Age as to the physical place that was the Americas. The refrain that closes the third stanza, editors Pennington and Northrup note, was probably to be repeated with each verse. Spelling has been left unchanged from the manuscript, which is in the Bodleian Library at Oxford University, although the editors did add punctuation. “Have You Not Hard of Floryda” yet awaits adaptation and performance by contemporary musicians. Hallock, Thomas. 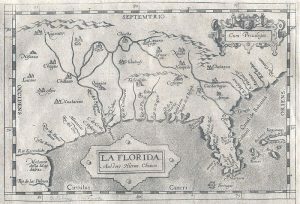 “Between Topos and the Terrain: The Environmental Literature of Florida, 1513-1821.” Paradise Lost? An Environmental History of Florida. Ed. Jack E. Davis and Raymond Arsenault. Gainseville: U P of Florida, 2005. 25-46. Jones, Jane Anderson and Maurice J. O’Sullivan. Florida in Poetry: A History of the Imagination.Sarasota: Pineapple, 1995. Pennington, Edgar Legare and Clark Sutherland Northup. “An Early Poem on Florida.” Florida Historical Quarterly 7:1 (July 1928). 72-74. [Anonymous.] “Have you not hard of floryda” (Bodleian Library, Oxford University, Ashmolean Manuscript 48:140b:141). In Edgar Legare Pennington and Clark Sutherland Northup. The Florida Historical Society Quarterly 7:1 (July 1928). 72-74. As you abrode wyll compell. and yt for tryfels sell? trysky, trym, go trysky, wun not a wallet do well? Lyke pretty wons as the be. Like prety wond as the be. wunnot a wallet do well? They doth ther duty well.